Queen's We Will Rock You is undoubtedly one of the world's best-loved and most-played stadium anthems. 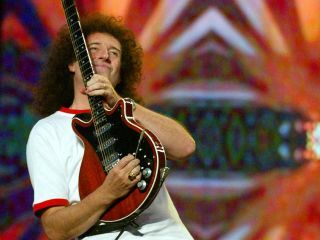 As simple as the song sounds, its construction was anything but: guitarist Brian May revealed that his degree in astrophysics helped in the recording of crucial 'stomp-stomp-clap!" rhythm of the song. May continued: "Now, much later on, people designed a machine to do this. But that's what we did. When we recorded each track, we put a delay of a certain length on it. And none of the delays were harmonically related. So there's no echo on it whatsoever, but the clapped sound - they spread around the stereo, but they also kind of spread from a distance from you - so you just feel like you're in the middle of a large number of people stamping and clapping." "We were very lucky," he said. "We were working in an old, disused church in North London, and it already had a nice sound. And there were some old boards lying around, but they just seemed ideal to stamp on." May admitted that he was amazed when the song caught on with audiences of all stripes. "I didn't realize that it would translate to sports games. This is an amazing thing," he said. "We Will Rock You and We Are The Champions have kind of transcended the normal framework of where music is listened to and appreciated - they've become part of public life, which I feel wonderful about. "It's fantastic to me, if I go to a football game or a soccer game or basketball or whatever - or any place all around the world - and there it is. And I think, My God. Most people don't even realize that I wrote it. Most people don't realize that it was written. It's sort of become one of those things that people think was always there. So in a way, that's the best compliment you could have for the song." In the same interview, May spoke eloquently of his late bandmate Freddie Mercury and his role in writing the equally beloved epic Bohemian Rhapsody: "This is Freddie's great baby and, yes, we all contributed to the way it developed in the studio, but really, it was so much constructed in his head before he ever stopped in there. It's an amazing thing. An amazing creation and quite unique."